On opening day at Del Mar racetrack (July 19, 2017) top local trainer and crafty claiming horseman Peter Miller entered the 6yo gelding, Belisarius (Ire), in a $16,000 claiming race going one mile on the dirt. On the ‘surface’ the winner of $174,659 lifetime looked like a major player. Although all his wins were on the grass (and this was on the dirt), Belisarius was making his third start off the layoff, getting a switch to a high percentage jockey, and was getting a sharp drop in class. At morning line odds of 8-1, he looked juicy … at first glance. However, handicappers are always warned to look beyond the first glance. 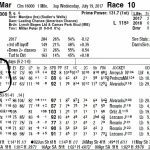 With a closer look, one could see that Miller had dropped this runner in class three consecutive times since he had been moved into his barn from that of Hall of Famer Bill Mott. His first start for Miller was an also-ran effort in the Grade 2 Del Mar Handicap. He then returned off a layoff, dropping sharply in class to an optional claimer, two other than. He ran dead last in the field of six, beaten nearly 16 lengths. He then received an sharp drop in class to a $35,000 claimer for non-winners of three races lifetime. Off at 6-1, he defeated two horses. So, let’s try another drop in class and a surface switch. Red flags don’t come any bigger. Miller was desperately trying to find a spot where the once-sound horse could be competitive. We don’t know why, but some reason this horse had soured on racing. Bet down to odds of 6.10 to 1, Belisarius was never competitive en route to a fifth place finish. Miller wasn’t done yet with the class drops. On August 5, he ran for $8,000 at Del Mar and finished a non-competitive sixth. Class drops are not always positive, especially when it is a series of consecutive class drops that do not result in improved performances. Thirty yards out of the gate, Saturday’s $300,000 Grade I Bing Crosby Stakes [July 29, 2017] went from high expectations to high anxiety. When 2016 Eclipse Award sprinter Drefong suddenly shot to the left at the gap where the chute meets the main track, sending Hall of Fame jockey Mike Smith flying, the race was changed and so were the thoughts of fans and the connections of the horses speeding down the backstretch. Drefong put himself back into the race and completed it without a rider. The 4-year-old colt’s position among the front-runners caused concern among the other riders and it affected the outcome when Drefong forced eventual runner-up Roy H. six paths wide turning into the stretch and created an inside route that Ransom the Moon and Flavien Prat took to victory. Drefong came out of the race unharmed. Smith was checked at the track first aid station after the race and released, saying he was fine with no reports to the contrary coming from Baffert or Smith’s agent Brad Pegram on Sunday. Phil D’Amato, trainer of Ransom the Moon, was there with Baffert, observing Sunday morning workouts. D’Amato had celebrated exuberantly, just outside the winner’s circle, with his crew and owners Mark Martinez of San Antonio, Texas and Jeffrey Wilke of Omaha, Nebraska, when Ransom the Moon crossed under the wire. Ransom the Moon came out of the race “in good order,” D’Amato said. Miller, contacted by phone at the San Luis Rey Downs training center in Bonsall, said Roy H “got clipped” in a close encounter with Drefong but the injury didn’t appear to be serious. Miller will wait to make a decision on the next start for Roy H. D’Amato indicated that Ransom the Moon would have a race in the fall at Santa Anita and then return here for the $1.5 million TwinSpires Breeders’ Cup Sprint on November 4. The Bing Crosby was a “Win and You’re In” challenge series qualifier for the Breeders’ Cup Sprint. Baffert said the Grade I, seven-furlong Forego Handicap on August 26 at Saratoga was a possibility for Drefong. The Grade II $200,000 Pat O’Brien Stakes, also at seven furlongs, is here the same day. The Pat O’Brien is a “Win and You’re In” qualifier for the $1 million Las Vegas Breeders’ Cup Dirt Mile here on November 3. The major stakes races of the first two Saturdays of the meeting have been upsetting, in more than one sense of the word, for Baffert. In the TVG San Diego Handicap on July 22, world leader Arrogate finished fourth and Saturdaybrought the Crosby misfortune. But exasperation doesn’t seem to be an option for the 64-year-old Hall of Famer. See Arrogate July 22, 2017 at Del Mar. On select major days throughout the year, I offer my professional analysis of the big race, e.g. Preakness, and the undercard races at that track. This past Saturday I did the 14 races on the Pimlico Preakness card, which is always a great day of wagering. One of the key aspects of my report is the pace scenario analysis for each race. If you don’t understand the expected pace of the race, it can be very difficult to select the winner or the top finishers. How the race sets up is critical to predicting the outcome. In turf sprints I almost always emphasize early speed, especially if it is a 5 furlong grass race. 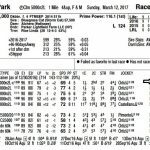 In analyzing the pace of race #2 on Saturday (May 20, 2017) one horse jumped out to be as the lone speed. #1A FLIGHT CREW was 20/1 on the morning line, enough to scare off many horseplayers. After determining that he was probably the early pace setter, I needed to look at the overall early pace to determine if he could “hold on.” Was there enough other early speed to put pressure on him at some critical early juncture of the race? I came to the conclusion that the answer was “no.” It looked like a moderate pace, so now I was very intrigued with this longshot and dug deeper. He was the son of Elusive Quality, who has sired many good horses sprinting on the law, and out of a mare by Danzig (enough said). The pedigree was certainly there. This was only the 2nd career grass start for Flight Crew. In his only other attempt, he pressed a fast pace (+17 +19 on the BRIS Race Shape figures) while going 1 1/16 miles on a good turf course. Despite that, and breaking from a poor outside post, he still ended up defeating half the field, finishing 5th. He was trained by 15% local horseman Hugh McMahon. What else did one need to pull the trigger on a big longshot? Pace makes the race. Flight Crew did not get the initial lead but by the time the field hit the far turn of this turf dash, he was in complete control. At odds of 9-1, he opened up under Katie Davis and kept the field at bay down the lane. Scores like this are very sweet indeed. Make sure you analyze the pace of every race you wager. It’s the first step to selecting many winners. 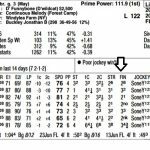 Handicapping Tip of the Day #38 – Does the Favorite Make Sense? Claiming races have often been compared to poker games. The crafty trainers are making moves and hoping that their competition guesses wrong. Recently at Laurel Park, red hot trainer Linda Rice (43% winner on the meet) had the overwhelming favorite Cheering On Al. On the surface and with a cursory glance, the four-year-old filly look near unbeatable. She had been very competitive at claiming levels more than three times the price of today’s race. But therein lied the rub. Why in the world was she in for only a nickel ($5,000) given her recent form? Also, why had she not run back within two or three weeks off the claim? Her last race gave a clue as to why. Bet down to odds of 7/5 she failed to hit the board, fading quickly in the final 1/16th of a mile. Still, the fourth place finish beaten just over four lengths was a performance that should crush today’s competition. Right? That disappointing race, however, came for trainer Rudy Rodriguez, who is difficult to claim off of, and she had been shelved since the race in late December. Red flags were popping up. Does the betting favorite make sense? If you had just claimed this filly, would run her in this spot? You would only do so if her soundness was less than 100 percentage, and you were not happy with your $16,000 purchase. That apparently was the case in this spot, as the connections were willing to unload her for $5,000. She was a sucker bet at odds of 0.60 to 1, and she ran accordingly. These opportunities don’t come along every day but they do appear frequently enough. I just happened to be on 5-1 shot Weatherurnot, who looked like a winner in deep stretch, only to be nailed by a big longshot with improving form. LOS ANGELES — Even the smartest people sometimes get their wisdom from strange places. Take Jon White, a horse racing encyclopedia who doubles as the morning-line oddsmaker at Santa Anita. There is one particular type of favorite that the experienced horseplayer should never fear. I’m talking about the type of public choice, especially a maiden, who always runs well enough to get bet next time out. His or her past performances always look like a horse in sharp form, with strong speed figures, and running lines that include a lot of 1-2-3s. But what is always in common is a lot of “two’s” and “three’s” at the finish position. This is the type of runner that lacks the will to win. The horse is talented. The horse has speed. The horse runs good enough to nearly get his picture taken, but the horse doesn’t want to “go on” and win the race. A recent race at Finger Lakes was a perfect example of a money-burning maiden that fit this bill. November 15, 2016 at Finger Lakes featured the heavy favorite Hazen’s Notch. The New York-bred of D’Funnybone was seven-for-seven in the money racing at distances from 5 1/2 furlongs to 1 mile and 70 yards and over tracks labeled fast, good and sloppy. The versatile gelding was coming off another ‘good’ effort, a 2nd place finish at 3-1 odds at the maiden special weights level only 14 days prior. But look closer and this horse was life and death to hang on for second while drubbed 8 lengths by another rival. 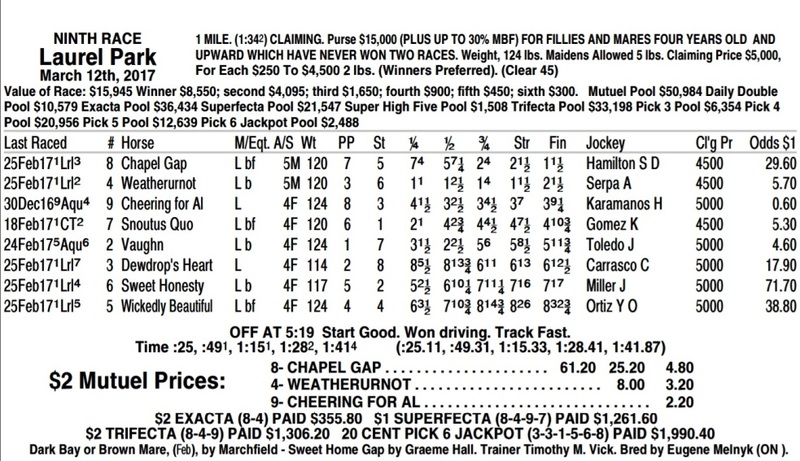 In only one of his last five races had this horse gained ground in the stretch. In all but one of his seven career races he went off at odds of 3-1 or lower. He was expected to win nearly every one of these races by many handicappers and had failed. On this day Hazen’s Notch was odds-on during most of the wagering before finally settling at 1.05 to 1 at post time. He finished third, beaten only two necks for all the money, behind $18.40 winner Winlocs Utopia. The chart caller’s comments read: Hazen’s Notch was well placed along the two path, angled out in the lane, gained some and hung. Reprinted with permission, this article discusses the best exacta strategies in horse racing. The Exacta is many horseplayers first taste of exotic wagering. In horse racing the Exacta requires the bettor to correctly select the first two finishers in a race. 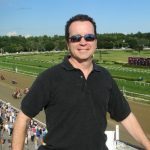 There are many ways to play the Exacta but most horseplayers are taught to play the Exacta in the most inefficient way, thus foregoing the opportunity to maximize their returns. I was guilty of falling into the trap because it was the way everyone played the Exacta, in fact it was the way the racing program suggested to play. Lucky for you I am here to teach you how to maximize your returns when betting the Exacta but before we get to that let’s take a few minutes to discuss the wrong ways and why they should be avoided. The most common way to bet the Exacta is by boxing two or more horses. This is the strategy referred to earlier. Boxing your horses means they can come in any order so long as they finish first and second. At first glance, and to a novice, this might look like a great strategy because it provides a little cushion in case you are not perfect in your handicapping. What it also does is minimize returns because you are giving each combination an equal chance of winning. While there may be a rare occasion when you think two horses have an equal chance of winning or running second that should be the exception not the rule. Betting an Exacta Box is not only inefficient it can also be costly depending on the number of horses you use. 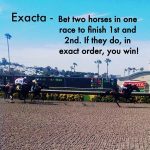 A two horse Exacta Box costs $2 (2 x 1 = 2) for each $1 bet, a three horse Exacta Box costs $6 (3 x 2 = 6) for each $1 bet, a four horse Exacta Box costs $12 (4 x 3 = 12) for each $1 bet and so on. It may seem like a good way to bet but the cost and the likely return suggests otherwise. For example suppose you bet a three horse Exacta Box for $1. Your investment would be $6. If two of your horses are favorites and run one-two you might make a few dollars or depending on how much was bet on the combination you could conceivably lose money. The only benefit of boxing an Exacta is it will produce a higher win rate, meaning you will cash more tickets. In return, however, you will be minimizing your profits. The most efficient way to bet the Exacta is by weighting each combination. The second most common way to bet the Exacta is a wheel. An Exacta Wheel involves picking one horse to win and “wheeling” it with the rest of the field. If your horse wins you win the Exacta but again you are not maximizing your returns. You are actually putting yourself in a position that adds more luck to the equation then necessary. Basically you are hoping your horse wins the race and the longest shot runs second. Unfortunately there is a much better chance one of the logical contenders will fill out the Exacta. That result will produce a much lower payout than if the longest shot ran second. Let’s say you find one horse you really like to win but you cannot figure out who will run second. The best option would be to bet the horse to Win and forego the Exacta. 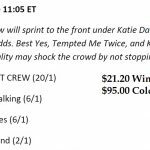 The more likely decision will be wheeling your horse in the Exacta and praying for a long shot to come in second. If the race had ten horses the Exacta wheel would cost $9 (1 x 9 = 9) for each $1 bet. In a ten horse field the Exacta will usually pay more than $9 for a $1 bet so if your horse wins you will most likely make a profit but at what cost? Let’s say your horse is 3/1 and wins. You bet a $1 Exacta Wheel which costs $9. A logical horse runs second and the Exacta returns $20 for a $1 bet. You excitedly make your way to the betting window to collect your $11 profit. What you fail to realize is you left money on the table. Had you bet that same $9 on your horse to Win you would have won $36 (9 x 3 + 9 = 36) for a profit of $27 (36 – 9 = 27). The Win bet would have made you a profit of $27 while the Exacta only netted you $11. There will be instances when a long shot finishes second and the Exacta returns more than the Win bet but more often than not one of the favorites will run second thus reducing the return. The Exacta Part Wheel is a step in the right direction. This bet involves wheeling your horse over a few other horses. This is a much better strategy than wheeling the entire field second because it costs less. In the same example from the previous section let’s say you decide three horses can run second behind your top pick. A $1 Exacta Part Wheel would cost $3 (1 x 3 = 3) for each $1 bet. Now you have shifted the odds in your favor. The $3 Win bet would only return $12 (3 x 3 + 3 = 12). 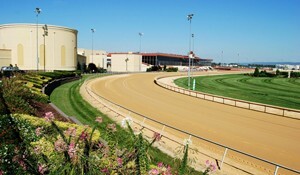 The Exacta would return $20 for each $1 bet resulting in a profit of $17 (20 – 3 = 17). In this scenario the Exacta returned $5 more than the Win bet for each $1 bet. A more effective way to play the Exacta Part Wheel is to bet more than a dollar on the combinations. I used this strategy on Belmont day in the Easy Goer Stakes. I thought the favorite, Teeth of the Dog, was the most likely winner. He went to post at odds of 2/1, not very appealing for a Win bet. I decided there were two horses that were most likely to finish second, Skyring (6/1) and Fast Falcon (27/1). I gave both horses the same chance of running second so I bet a $5 Exacta Part Wheel with Teeth of the Dog over Skyring and Fast Falcon. As expected Teeth of the Dog outclassed the field and won 3 3/4 lengths. Skyring faded to last in the stretch but long shot Fast Falcon closed stoutly and just got up for second. The $5 Exacta returned $418.75. The $10 Win bet on 2/1 Teeth of the Dog would have returned a measly $30.50. In this situation the Exacta Part Wheel provided the maximum return. It also showed that you can make money betting favorites, if you do it the right way. In the previous example had I thought Fast Falcon was more likely to run second I could have spent the same $10 by betting a $7 Exacta of Teeth of the Dog over Fast Falcon and a $3 Exacta of Teeth of the Dog over Skyring. 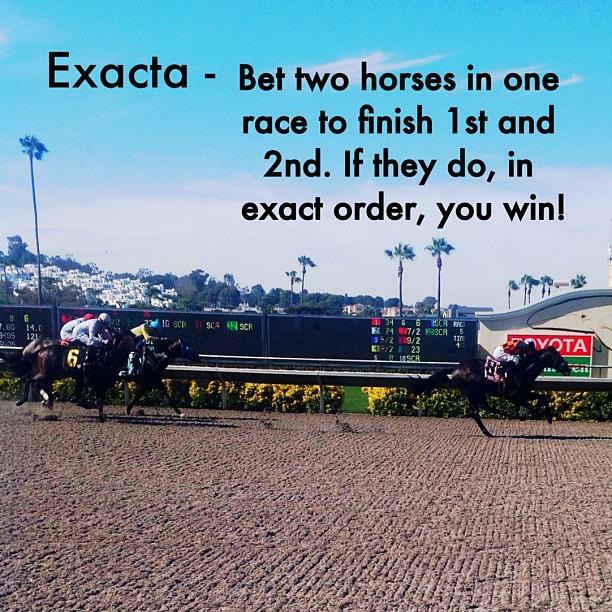 Weighting your Exacta combinations is the best way to maximize your returns long term. Instead of being lazy and boxing your horses or wheeling them you should take a few minutes to think about what chance each horse has of winning and/or running second and then bet accordingly. An alternate example of the Weighted Exacta would be if you like two horses that you think will run first and second. Let’s say the first horse is twice as likely to win as the second. For the same $10 you could bet a $7 Exacta with first horse over the second horse and a $3 combination reversing it. If your horses run one-two you win and if you are correct that the first horse is more likely to win then you will be rewarded accordingly with a better return. The Exacta is a great way to make money betting on horses. Unfortunately most horseplayers are taught to bet the Exacta inefficiently by either Boxing it or Wheeling their horse. Smart horseplayers, which includes you since you just read this, will instead bet Exacta Part Wheels or Weighted Exacta’s. I hope this helps you make more money betting the Exacta, it has done so for me. If you have others ways of betting the Exacta please share them in the comments below. If you found this post to be helpful please share it using the social media buttons below, and if you haven’t already done so, join the AGameofSkill.com monthly newsletter by leaving your email address in the form below. Many players get caught up in the “off” track versus a “fast track.” That is a mistake. There is only one type of fast, but there are multiple versions of “off.” It is important to know the differences with the most important difference being a “sloppy” track as opposed to a “muddy” track. A sloppy track may have puddles of water on the top of the surface but the track is such that horses can have excellent footing. In fact, you will sometime see times for a sloppy track be as good, or better, than a fast track. A muddy track is a different story. Once the water mixes well with the packed sand, a muddy track is created and can be like ‘goo,’ or even soft-but-thick peanut butter. Normally the times on a muddy track are noticeably slower than fast or sloppy. There are no real standard distances in horse racing other than the classic races and the classic distances. While many tracks offer 6 furlong events, there are many that also card everything from 4 1/2 furlong events to 1 and 3/8 mile races and everything in between. It can get confusing and, despite the advent of speed figures and the use of track variants to help in comparing racing times, there is still some confusion and some inequities. I don’t trust speed figures for races under 5 1/2 furlongs because I have found that at the shorter distances, speed figures have a tendency to jump up and appear as though a horse was really much faster than it really was. A horse that has been racing in 5 furlong races may post speed figures of 100 while switching to 6 furlong events will have it posting nothing higher than a 90. I’ve seen this pattern over and over. Therefore I am very careful about comparing speed figures when horses are going from races of less than 5 1/2 furlongs. The same is true of races over 1 1/4 miles, they just don’t seem to compare well. While many of the larger tracks shy away from races of odd distances, the smaller ones seem to embrace them. One pattern I have seen repeated is that a horse will ship into a larger track from a bush track. That horse has been racing at the odd distances and seems to have speed figures that make it a contender, but when the gate opens it trails the field, unable to keep up. It isn’t long before that runner is back at the bush track, seemingly burning up the course. The problem isn’t just that the competition was tougher, it is that the horse never really was as good as its speed figures made it appear to be. On the other hand, look out for horses that do specialize at the odd distances. There are some horses that seem to prefer races of five furlongs or seven furlongs who regularly fail at the more prevalent distance of six furlongs. If a trainer seems determined to get a horse in a race of 5 furlongs or seven furlongs and seems to wait for those opportunities, it may be that he or she realizes the horse has a penchant for those distances and will excel at them while failing at the commonly-run six furlongs, even if it is in with a softer field. Horses, like people, have their quirks and preferring a particular distance to race is one of them. The most consistent horse racing systems have to have the basics and a handicapper must understand the basics. I have been around horse racing for 50 years including as an owner. Without the basics the rest is not going to do any good. If you want to learn how a horse owner and insider handicaps just go to Matchbook and get the truth. Also, for the latest horse racing odds, visit Matchbook.